Maria Montoya (1887-1980) and Julian Martinez (1885-1943) of San Ildefonso Pueblo were married in 1904. For their honeymoon they traveled to the St. Louis World's Fair where Maria made pots and Julian danced traditional dances with other men from the pueblo. Both were in their teens. The period of their youth was one of artistic revival and development in the pueblos, encouraged in great part by Edgar Lee Hewett. An archaeologist and anthropologist, and later the first director of the New Mexico Museum of Art, Hewett promoted Native artists and their work. He encouraged Julian in his watercolor painting in a modern style being developed by Maria's brother-on-law, Crescencio Martinez, at San Ildefonso. 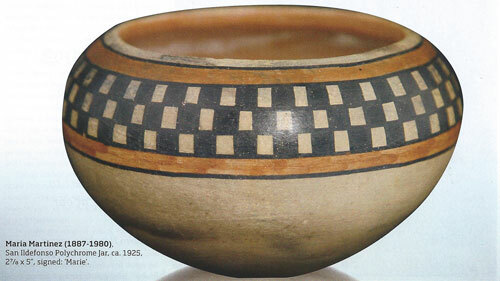 Traditionally, pueblo women made the pots and the men often decorated them. On his archaeological digs on the Pajarita Plateau, which began in 1907, Hewett found intriguing shards of pots that were no longer being made in the region - including some that were black-on-black. Julian was a digger on the expedition and Maria visited the site. Hewett encouraged them to produce pottery with the lost black-on-black technique. After much experimentation, the couple found a way to produce the glossy pottery with matte designs that they are now known for. In the early years of making polychrome pots, Maria didn't sign them. As they became popular among the tourist market she began signing them "Marie" because she thought the non-Indian spelling would be more popular. She began adding Julian's name in 1925. Among the pieces in the current exhibition of her work at Medicine Man Gallery is a polychrome jar signed "Marie" from 1925 and a black-on-black plate from 1930 signed "Marie + Julian." After Julian's death, Maria worked with her daughter-in-law Santana (1909-2002) who decorated the pots. 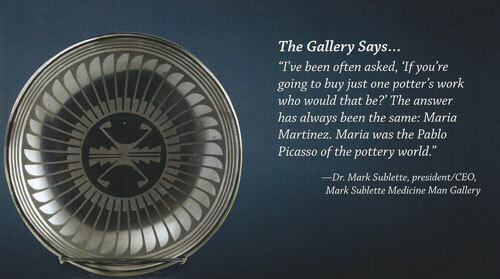 A black-on-black gunmetal feather pot circa 1940-50 bears the signature "Marie & Santana." The feather pattern had been adapted by Julian from an ancient Mimbres design. Maria Martinez (1887-1980) and Popovi Da (1921-1971), San Ildefonso Gunmetal Feather Plate, October 1969, 2"x10-3/4", signed: "Maria-Popovi 1969"
By 1956 Maria and Julian's son Popovi Da (1922-1971) became her partner in pottery making and she began signing the work "Maria - Popovi." A plate with he feather design from 1969 is in the exhibition. Art historian Sheila Hoffman has written of Maria, "For reasons of merit and circumstance, her fame surpassed those in her craft who preceded her, and it remains un-eclipsed by those who follow."